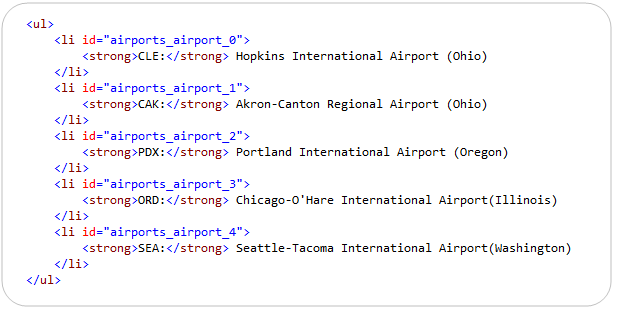 In this article, Scott examines the important changes that have been made to make Web Forms in ASP.NET 4 generate clean, standards-compliant, CSS-friendly markup. He also demonstrates how to provide better control over the ID attributes rendered by server controls to the client with the help of screenshots. This is the sixteenth in a series of blog posts I’m doing on the upcoming VS 2010 and .NET 4 release. Today's post is the first of a few blog posts I'll be doing that talk about some of the important changes we've made to make Web Forms in ASP.NET 4 generate clean, standards-compliant, CSS-friendly markup. Today I’ll cover the work we are doing to provide better control over the "ID" attributes rendered by server controls to the client. ASP.NET 4 provides better support for building standards-compliant pages out of the box. The built-in <asp:> server controls with ASP.NET 4 now generate cleaner markup and support CSS styling – and help address all of the above issues. When the controlRenderingCompatbilityVersion flag is set to “3.5” your application and server controls will by default render output using the same markup generation used with VS 2008 and .NET 3.5. When the controlRenderingCompatbilityVersion flag is set to “4.0” your application and server controls will strictly adhere to the XHTML 1.1 specification, have cleaner client IDs, render with semantic correctness in mind, and have extraneous inline styles removed. This flag defaults to 4.0 for all new ASP.NET Web Forms applications built using ASP.NET 4. 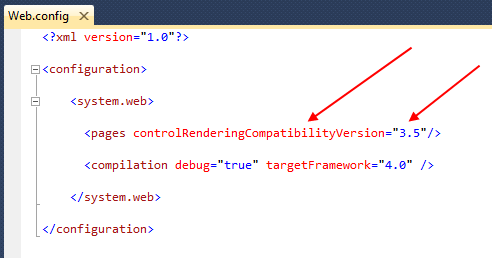 Any previous application that is upgraded using VS 2010 will have the controlRenderingCompatbilityVersion flag automatically set to 3.5 by the upgrade wizard to ensure backwards compatibility. You can then optionally change it (either at the application level, or scope it within the web.config file to be on a per page or directory level) if you move your pages to use CSS and take advantage of the new markup rendering. This gives you the flexibility to customize/override the naming behavior however you want. This ID is unique (which is good) – but rather ugly because of the “ct100” prefix (which is bad). Notice that the “ct100” prefix is gone. Because the “Message” control is embedded within a “MainContent” container control, by default it’s ID will be prefixed “MainContent_Message” to avoid potential collisions with other controls elsewhere within the page. 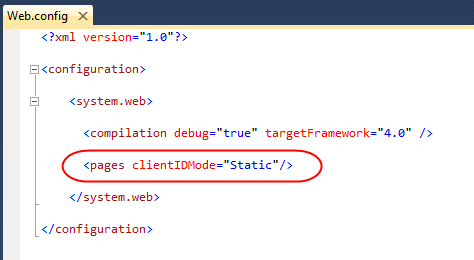 Markup Rendering when using ASP.NET 4 and the ClientIDMode is set to "Static"
This option now gives you the ability to completely control the client ID values sent down by controls. Data-bound list/grid controls have historically been the hardest to use/style when it comes to working with Web Form’s automatically generated IDs. Let’s now take a look at a scenario where we’ll customize the ID’s rendered using a ListView control with ASP.NET 4. ASP.NET 4 enables you to generate much cleaner HTML markup from server controls and from within your Web Forms applications. In today’s post I covered how you can now easily control the client ID values that are rendered by server controls. 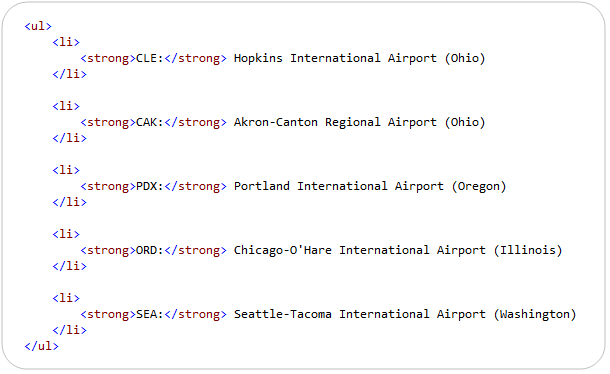 In upcoming posts I’ll cover some of the other markup improvements that are also coming with the ASP.NET 4 release.